Pots and planters can transform a garden, create extra planting capacity and enable you to grow plants that wouldn't otherwise grow in certain soil conditions or aspects. You'll find a wide range of pots and planters here at Avon Mill Garden Centre, together with an interesting selection of free-standing and wall mounted garden statutary, including green man plaques, bird baths and water features. Containers come in a wide range of materials, including traditional teracotta, stone, resconstituted stone, wood, metal and plastic. 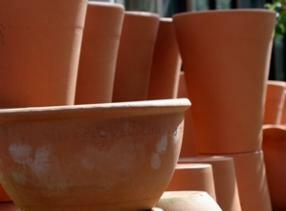 If weight is an issue, for example on a balcony, choose a lighter weight pot. Our staff can advise which containers are frost proof. We also have a good selection of hanging baskets, wall mounted baskets and liners. Don't forget to your plants will need to go into compost suitable for container growing and will need to be fed regularly too. We can assist with delivery of heavy items.